Homemade Basil Pesto is great to have in a jar to add to sandwiches, toasties, turkish bread melts, or just about anything. I especially love it with spaghetti and also with zucchini pasta – delicious. 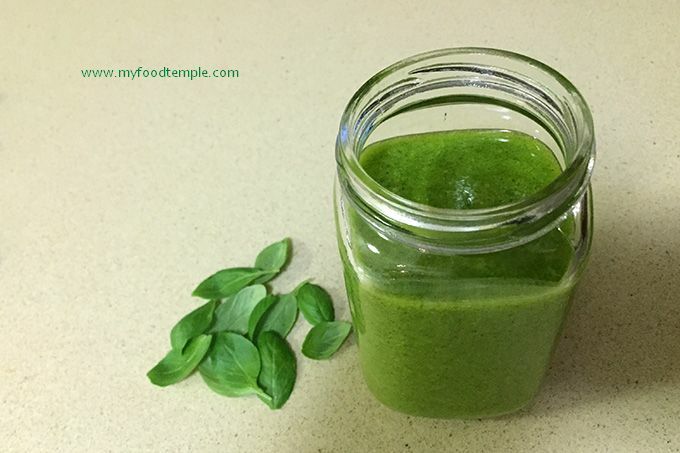 Basil is known to be anti-inflammatory, anti-bacterial, is rich in anti-oxidants, protects the body from free radicals, has anti-ageing properties, and is loaded with Vitamin A. It is so quick and easy to make there are absolutely no excuses not to. Just blend all ingredients and you are done. It tastes great, and is so much better than the basil pesto you buy in the store. Make a jar and store it in the fridge. Blend for about 1-2 minutes or until smooth and well combined. Serve cold any way you like. Store in an airtight jar in fridge. I love this with spaghetti or zucchini pasta! It is great straight out of the jar, on its own - yum. You can have it as a dip, or drizzle it over your salad or over a burger. It is fantastic drizzled over open toasties or soups or slather it on some crusty bread.